The fastest way to wreck your lawn! By now, almost everyone has been out in the yard or their hired professional has. The leaves and sticks have been picked up and the first application of fertilizer has been applied and crabgrass preventer is down. Lawns should now be growing well. If you haven't already done so, it is time to pull the lawn mower out! Believe it or not, you are about to perform one of the single most important things that you can do for the health of your lawn. Every time that you mow your lawn, you are either aiding in the health and success of a high quality lawn or you are literally damaging it. With each and every cut! Whether or not you fertilize your lawn, water your lawn or apply applications of anything to improve your lawn, proper mowing practices are essential for a quality lawn to develop. The practice of proper mowing produces a generally better quality lawn than one not properly mowed. A properly mowed lawn looks better, will have less weeds, will withstand heat, drought and disease better and will have a deeper and stronger root system. So, how do you wreck your lawn? By mowing too short! Proper mowing is mainly about mowing at the right height. Turf grass makes sugar by photosynthesis using the sun for a food source. When your lawn is cut too short, the grass plants are forced to use their energy resources to grow the grass blade so this process can happen. It is essential that the plant have enough leaf area to perform this. Also, there has been shown, a direct correlation between the height of turf grass and the depth and mass of the root system. A shallow root system will be quickly apparent once the heat of summer arrives. With less rainfall during the summer months and less soil moisture, closely mowed lawns will be the first to show stress and the risk of turf death will be higher. Taller mowed grass will keep soil temperatures cooler and preserve soil moisture. The recommended mowing height for our type of cool season grasses in Northeast Ohio is 2 1/2 - 3" in the spring and fall and 3" or more during the summer stress periods. When performing maintenance mowing, I personally never mow below 3". Now that we have discussed what is probably the single most important thing that you can do right for for your lawn, there are a few other things to share about proper mowing. Your lawn should be mowed often enough that you are only taking the top 1/3 of the grass blade. I know how difficult this can be, especially in the spring, maybe seemingly impossible! But, one should try to meet this as closely as possible for the health of your home turf! One way that this may be accomplished more closely would be to consider mowing every 5 or 6 days when the grass is really growing well. Another mowing rule is to never bag your clippings! Mulching is much healthier for the lawn. First, you are adding organic material to the soil (that is what those grass clippings become), and second realize that this in turn is mini doses of free fertilizer. The grass clippings quickly break down, feeding your lawn. Grass clippings mulched into the lawn DO NOT add to thatch problems. Here are the last couple tips to improve your home lawn; Change direction frequently. This will keep your grass blades from getting pushed the same way with every cut causing it to want to lay down in that direction; Keep your blade sharp. Sharpen at least once, if not twice every season. This keeps you cutting the grass, not tearing the grass, causing brown grass tips which is unsightly as well as open a larger surface area for lawn fungus to attack the grass blades; Try to mow when dry. This will make things a little easier for your mower. Wet grass is heavier and harder on your mower engine. These practices will improve the quality of your lawn all by themselves. I mow lawns for customers that choose to not fertilize or treat their lawns, and these practices improve the appearance and health of their lawns in just weeks. There aren't many things as pleasing as a well manicured lawn. It really is just this easy. Most people wreck their lawns week in and week out, simply by improper mowing techniques. Well, now you know. Go out and mow it right and watch your lawn flourish! To seed or not to seed? That is the (spring time) question! 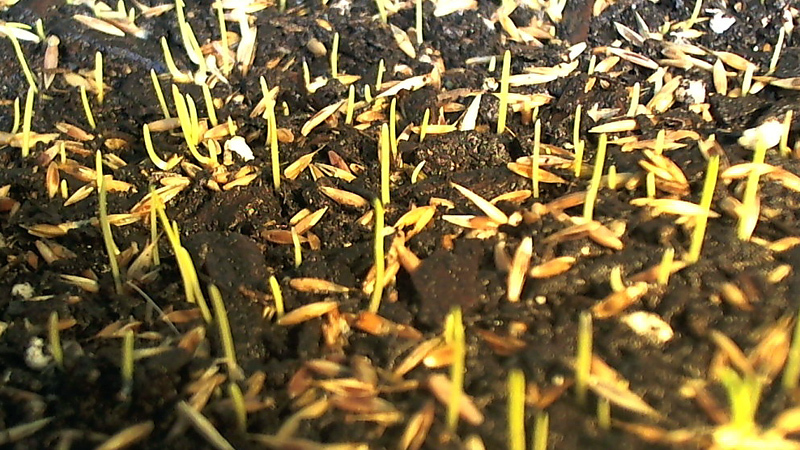 The truth is, you can throw seed down on your lawn any time that you want. But will this provide the seed the best chance for germination? Probably not. There are better times of the year to seed. The optimum time to sow grass seed in northern Ohio is between late August and the whole month of September. If seeding cannot be done before mid October, it would probably be best to postpone until spring because there may not be enough growth to survive the winter. For spring seeding, the earlier the better once you can get out to create a seed bed. For dormant or winter seeding, that is seed that is sowed around November 15th or later, the seed will not germinate until the following spring. We have two good grass growing seasons in northern Ohio. The spring and fall. These are considered growing season because the weather is cooler for our cool season grass types and there is typically more rainfall in the spring and fall. These things help our turf plants grow well and focus on healthy root growth. When the heat of summer comes and the rainfall decreases, our lawns usually slow down considerably and root development almost completely ceases. The reason that fall is the best time to seed is because the new grass will have time to mature and develop its root system before winter and then get another growing season in the spring to develop more-so before the heat of summer. When seed is sown in the spring, or with dormant seeding, the new grass has one growing season before the harsher summer conditions. Lawns that are sown in the spring, have a greater risk of being infested with undesirable annual weeds, including crabgrass because they do not have as much time to mature and thicken. Infestations of summer weeds are reduced in successful early fall seedings, because good lawn density develops before the weed seeds can germinate the following spring. If you do decide to seed in the spring, be certain that a crabgrass pre-emergent (crabgrass preventer) is not applied on or near your seeded area because these products will also prevent the germination of grass seed too! The same theories apply when over-seeding an established lawn as well. If you are looking to thicken your already existing lawn, one procedure that will help is aerating and over-seeding. The holes and plugs left behind from the aerating process provide bare soil surface that seed requires for germination. Fall aeration and over-seeding is preferred over spring time, but if you missed the fall opportunity, spring would be your next best choice. Again, just remember if you do this, make sure that you or your hired lawn care professional does not apply a crabgrass pre-emergent. A better choice would be to apply a starter fertilizer over your lawn for that fertilizer application as a substitute. What are those fuzzy patches on my lawn?! The early spring fungus, snow mold. When is the "right time" to apply your first round of fertilizer? You're thinking your lawn is all ready for a good heavy dose of fertilizer to wake her up. Well hold on, not so fast! Let's take a look back to last fall and the last application you put down and the real purpose of that application when winter was fast coming upon us.